The first Creed felt like a minor miracle, a Rocky movie that reinvented the franchise by tapping into what made it great and bringing it forward into a very different world. This film tries something even more difficult: it wants to redeem Rocky IV, the silliest, most over-the-top film in the series. The result has its flaws, but when it works it takes the franchise’s biggest dead weight and lifts it high over its head. On one level the story is little more than a series of fights and training montages as Creed (Michael B Jordan) wins the heavyweight title against a clapped-out champ, only to find a slick boxing promoter (Russell Hornsby) has a surprise for him: Russian punching machine Viktor Drago (Florian “Big Nasty” Munteanu), son of Ivan Drago (Dolph Lundgren). 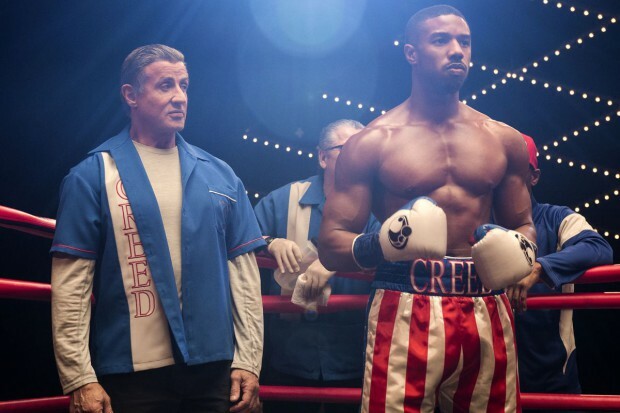 Everyone wants to see Creed take on the son of the man who killed his father – everyone except Rocky (Sylvester Stallone) – but does Creed really know what he’s fighting for? But this goes all in on the idea of fathers and sons, as just about everyone is dealing with family issues in various ways. The fights are solid, but the emotional moments hit hardest – especially the Drago family, who turn out to be this film’s bitter, beating (on others) heart. If you want to be taken seriously in Hollywood there comes a point where you have to make a movie that’s going to make money. Often that means taking on a superhero job, but an alternative for some is crime. And so Steve McQueen, director of 12 Years a Slave, is behind the camera for this adaptation of the Lynda La Plante 1983 miniseries Widows, which features a lot of style and flair, plus some great performances, and yet somehow seems to be missing something essential to a crime movie. It’s a great set-up: when their husbands / partners are killed mid-heist, their widows – led by Veronica (Viola Davis), whose husband (Liam Neeson) was leading the crime crew – have to commit a heist of their own to pay off a mobster (Brian Tyree Henry) who’s running for local government against the scheming son (Colin Farrell) of a local dynasty. There’s plenty of tension, the women’s plight is gripping and their growing confidence in their criminal skills is fun to watch, and McQueen keeps the pace at a steady clip. But the heist itself is perfunctory, the aftermath unsatisfying, and without that the rest of the film feels a little hollow. It’s a well made and entertaining film; it’s just not a great crime film. There’s a certain kind of Disney film that just feels like a product. You know the type: after a brief handful of scenes set in a twee version of the recent past (the more English the better) to establish various rote character conflicts almost always involving family (dead parents usually come in handy here), our plucky young lead finds themselves transported into a magical fantasy world that doesn’t really make a whole lot of sense and can possibly be read simply as a metaphor for our lead’s person issues. There she or he (but usually she) meets a collection of characters – some CGI, some big-name actors in outlandish costumes – while wandering through a variety of lavish yet somehow generic locations (forests are good, castles are better). It turns out there’s some long brewing conflict that’s just boiled over and now our heroine is the only one who can turn things around, only things are never quite what they seem and there’s some kind of unsurprising shock reveal where good guys turn bad (and vice versa) and the importance of not prejudging people or something, blah blah blah big fight return home magic is great all problems solved. If you like that, then enjoy this. There are a lot of interesting things going on in Fantastic Beasts: The Crimes of Grindelwald. The problem is that none of them manage to turn it into an interesting movie. There’s barely a story here. Grindelwald (Johnny Depp, remarkably restrained for late-period Depp and perhaps the best human thing in this film) escapes from magic prison while being transferred back to Europe, hides out in Paris, and marshals his forces. Everyone from the first film is back plus more, but while they’re all extremely busy sadly nothing they do has anything to do with what this film is really about, which is sorting everyone into two sides for the conflict that is to come. Dumbledore (Jude Law) pulls a few strings behind the scenes, but this takes itself way too seriously across the board, from the plodding pace and murky colour palette to the collection of doomed relationships and Grindelwald’s boringly reasonable evil. Previous Harry Potter films always had a good reason for non-fans to stop by and take a look; even the first Fantastic Beasts had a lot of, you know, fantastic beasts. But this is fan service pure and simple, aimed solely at those who’ll get worked up by a “canon-breaking” shock twist. Shouldn’t magic be more fun? When Milena (Kate Cheel) learns that her father (Daniel P Jones) is gravely ill, she heads off via bus to visit him in the town of Lightning Ridge in far north west NSW. A tiny opal mining community populated by people lured there by the hope of striking it rich, it’s a place of striking, alien beauty. This isn’t a film driven by story: for much of its run time scenes come and go, connected more by the visuals and a sense of loneliness and isolation than any driving plot. Things do happen here, as Milena and her father develop a relationship built more on the ruins of their past than by any attempt to repair it. But Russian-born, Melbourne-based director Alena Lodkina (who previously made a documentary about Lightning Ridge) is clearly focusing more on the feel of living at the end of the world, and the way the residents are trying to build their own lives there, free from the ties and bonds we take for granted. This one will be screening at Geelong Pivotonian Cinema.